Reflecting victory days gone by. Amidst your sunset’s wispy grays. To be dismissed by idle rocking chairs. An honored spot of love. Lives woven in your Tapestry. 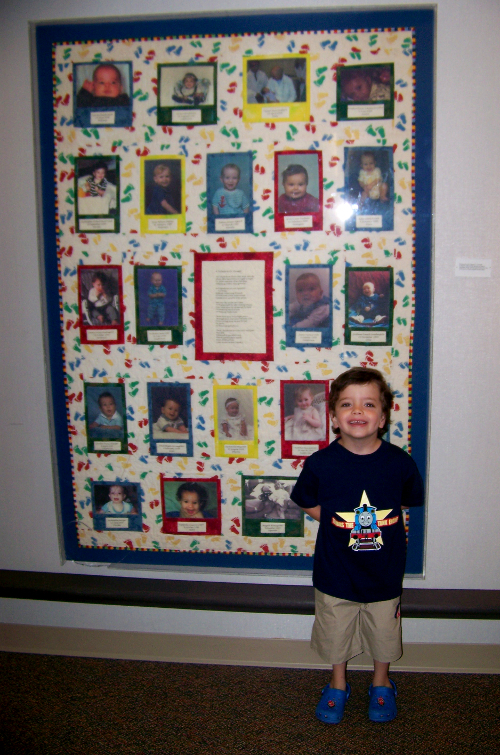 The quilt was presented by appreciative “Ponseti baby” parents to Dr and Mrs Ponseti in March 2001. Allyson Egbert, mother of Joshua, who was treated by Dr Ponseti, arranged to have the quilt made and wrote the poem. She used photos of 22 of the Ponseti method babies whose parents had found him through the internet and also a photo of one of the first Ponseti Method babies in Uganda. It was thought that the quilt could be used to wrap around mothers holding their babies while sitting in the Ponseti wooden rocking chair as Dr Ponseti manipulated their babies’ feet. They decided to put the quilt up in the waiting room of the section where the children are casted at the University of Iowa Hospital Orthopaedic section.